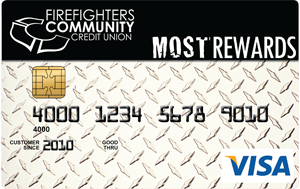 Use your Most Rewards card for things you are already doing and get rewarded! Earn points with every swipe! Redeem points for travel, merchandise, or cash! Earn points with every swipe! Redeem your points for travel, merchandise or convert Points-2-Cash. You can also make a charitable contribution to MDA or Rainbow Babies and Children’s Hospital using Points-2-Charity. 1. Direct deposit to Member’s FFCCU Share Account. 3. Donation to MDA or Rainbow Babies and Children’s Hospital. Looking for a card with a Great Rate? Ask our Member Contact Center by calling 800.621.4644 or chat with them on line by clicking the red “Live Chat” button on this page. *Learn about our VISA Credit Card Rates and Interest Charges here. New Card Holders: Receive 3,250 rewards points after completing your first purchase and an additional 3,250 rewards points after spending $500+ within 90 days of card activation.